Image: Alisdare Hickson (via Flickr CC). There can be no reconciliation unless both peoples, two communities of suffering, resolve that their existence is a secular fact, and that it has to be dealt with as such… Once we grant that Palestinians and Israelis are there to stay, then the decent conclusion has to be the need for peaceful coexistence and genuine reconciliation. In 2003, Tony Judt infamously declared that Israel was “an anachronism.” Consider, that the western democratic world almost unanimously decries any state which is founded upon an ethno-nationalist ideology, accompanied with some marriage of religion and state, as well as the inevitable relegation of groups of people outside this ideal-type to second-class standing, systematically or otherwise. Consider again, that this state, is effectively Israel. Let’s be clear, and unapologetically so: Israel, in its current, Zionist form (which is a self-described Jewish and democratic state that simultaneously denies both integration of and self-determination to Palestine), must be opposed. That claim, however, is quite different from claiming that Jews have no right to exist. The Israeli government’s very project has been leading us to needlessly conflate the two, and falsely believe that protecting against the latter claim depends on sustaining Israel’s current form. Here’s the thing. While Israel’s original inception understandably depended on a legitimate, initial victimization, it now sustains itself through a constant re-victimization in spite of things being markedly different from the time it was created. In doing so, it purports to face perpetual existential threat from Palestinian belligerents by first creating the very conditions for Palestinians to seek belligerence, and predictably crying victim when Palestinians are unsurprisingly, belligerent. Leaving that aside, at this point of a struggle that has become so depressingly protracted, debates about the manner by which Israel came to fruition are a non-starter. The harder but more pressing question is how to bring the dispute to a viable resolution and to the satisfaction of both parties—the only way to guarantee long-lasting peace. The international consensus prefers a two-state solution. This, would presumably be partitioned along the pre-1967 borders with the right of return for Palestinian refugees, have East Jerusalem as the Palestinian capital as well as the guaranteed demilitarization of Palestine and subsequent withdrawal of the Israel Defense Forces. But, in a conflict so outstretched and with painfully stalled and sporadic negotiations, conditions can only quickly or gradually deteriorate. The resounding failure of the international community to hold Israel to any serious grain of accountability for its systematic aggression has seen it develop the kind of unabashed hawkishness that may very well be beyond restraint. All other things remaining the same, the persistence of the blockade in the Gaza Strip could soon lead to a scale of deprivation and squalor that would forcibly expel Palestinians residing there. If the Israeli government’s aggression remains unchecked, its violent persecution could escalate to fit the terms used to describe the treatment of the Rohingya in Myanmar, the Yazidis in Iraq and Syria, or the Nuer in South Sudan. Illegal settlements encroaching into Palestinian land are unlikely to subside any time soon either. As things stand, the West Bank is a jumbled patchwork of Israeli settlements weaving through Palestinian towns. There are more than 600,000 settlers estimated to be in the West Bank who have institutionalized their stay by building thriving businesses, schools, hospitals and universities—it’s hard to imagine that this firmly entrenched community can simply be uprooted without opposition. Even in the best case scenario of a successfully negotiated two-state solution, the outcome is unlikely to be beneficial for Palestine. Israel has so thoroughly destroyed their infrastructure and state apparatus that an emergent Palestinian state would steadily assume a neo-colonialist, bantustan-like dependence on Israel. Either way, what’s almost certain in every case is continuing hostility towards the Palestinian people, precisely because the essence of Israel’s current existence and the coherence of its project depends on the presence of an overblown threat to it, one first imagined, then reified. The Israeli government has invested so much in fashioning the spectre of an Islamist-gevaar that it won’t dissipate once Palestine is fully self-determining within its own borders. If anything, it might birth a more bellicose Israel. Palestine, in becoming an ordinary, fully-fledged state, would in Israel’s mind deserve a fully-fledged provocation if deemed necessary. It is not wholly inconceivable that such a provocation may teeter towards a war-like militancy, if not fully spiral into war itself. 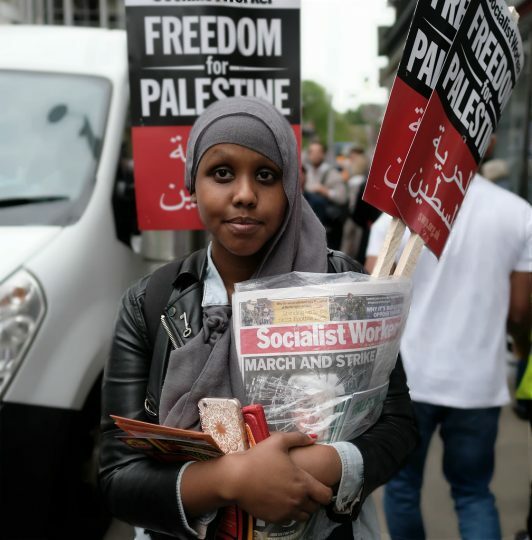 As an alternative, one post-Zionist future for Israel and Palestine envisions a secular, constitutional democracy built on a bill of rights guaranteeing universal adult suffrage, non-sectarianism, and the achievement of equality and dignity for all. It is the only option that retains the possibility for some kind of restorative justice scheme for atrocities suffered by both sides. Whatever the balance of culpability turns out to be (which is an unhelpful preoccupation to start with), the dispensing of justice should have reconciliation as its ultimate goal. Once again, Jews should obviously remain in Israel. That isn’t contingent on Israel remaining a Jewish state. When concerns arise about the threatened security of the Jewish people in a single state (having their origins in Islamophobic tropes about what would happen if Jews became a minority), they are easily rebutted by reference to the guaranteed protections a bill of rights would provide. Whatever concerns about the lingering second-class citizen status Palestinians would have in a single state, they are abated by the prospect of redress programs to account for generational and ongoing disadvantage—and perhaps even a return to Israel’s more radical economic roots. This isn’t to naively view the one-state state solution as a panacea. Important questions about its feasibility, as well as around the actual wishes of the Palestinian people naturally spring up. Admittedly, not only is the political will almost completely lacking under the leadership of returning Israeli Prime Minister Benjamin Netanyahu, but it would expectedly be absent in Palestine. The Palestinian people have become so desperate for a break from the brutality of the Israeli government that the short to medium term emancipatory agenda has to be focused on campaigning for a relaxed blockade, the release of arbitrarily detained prisoners, and the provision of essential services. But leadership need not come solely from America. Unlike most parties who will probably be pinned to frustrating political and moral compromises, South Africa is uniquely placed to exert unapologetic moral leadership. This role has been earned seeing as not only did we successfully negotiate a largely peaceful settlement following Apartheid to the astonishment of the rest of the world, but two decades on, can take cognizance of what worked, what didn’t and what could’ve been done differently. We are the modestly successful test case for a unitary constitutional democracy after a long, bitter conflict. For now, South Africa’s role has been fairly tame. By belonging to a host of softly outspoken countries, our foreign policy movements have typically been in calling for a two-state solution, the withdrawal of IDF forces from Gaza, and kicking off a set-piece of diplomatic censures such as recalling ambassadors when violence flares up. Honestly speaking, our lack of political and economic capital renders most of these actions toothless. What still remains untapped, is our potential for moral leadership. During our own struggle against a racist, Apartheid state, South Africa was once at a crossroads where after years of protest to no avail, the future of the country was uncertain. What happened in 1955, became a seminal moment in South Africa’s Apartheid history. The adoption of the Freedom Charter was led by what was then known as the Congress Alliance, a multi-racial political alliance co-ordinated by the African National Congress (ANC) and bringing together radical movements consisting of Blacks, Whites, Indians and Coloureds, a large segment of which were Jewish and Muslim—all united in their opposition to the ethno-nationalism embodied by Apartheid. The Freedom Charter’s adoption is rightly considered a centerpiece of the Apartheid struggle. It would capture the popular imagination of South Africans by its audacious presentation of an alternative social order, one picturing a non-racial South Africa where “no government can justly claim authority unless it is based on the will of the people.” The demands made in the Freedom Charter were a forerunner to our present Constitution which is widely considered the most progressive in the world, and was brought about after a painstaking, multilateral negotiation effort in the 1990s. So then, what can South Africa do by way of concrete action? It can start by boldly favoring the one-state solution as a foreign policy position. Crucially, this can’t happen simply by paying lip service to the idea, but must include real efforts aimed at supporting, coordinating and mobilizing activists from the movement and giving them the platforms plus resources to rally the cause—much like was done during Apartheid for our own freedom fighters in exile across the world. But, taking stock of what’s developed in the situation 10 years later, at its 54th Congress the ANC “calls on the Palestinians to review the viability of the two state solution in the light of the current development.” It’s welcomed that the ANC is moving to downgrade the South African embassy in Israel, and it must now take the one-state alternative seriously. Even if it doesn’t create the appetite, reviving the one-state solution would serve well to inject new energy to a conflict that’s been dismayingly stagnant. It might even scare Israel to double down on the two-state solution. By the modern Israeli state’s own admission, the only way to undercut its near-irrefutable, seeming moral high ground (without being called an anti-Semite), is not in striving toward a state of affairs that would retain its rhetorical feasibility (the two-state solution), but for one that would render it rhetorically obsolete (a single, secular and democratic state). The Boycott, Divestment and Sanctions movement would have more force if Israel was not just a quasi-Apartheid state, but an Apartheid state proper. That said, the South African government (regardless of the strength of the Apartheid analogy) should also enact boycotts, divestments and sanctions against Israel. Fixating on what the situation in Israel and Palestine should appropriately be called, although once being a relevant consideration raised in good faith, has slowly become beside the point. Now, it’s being weaponized as the favorite red-herring of the Israeli government’s apologists who swiftly come to the government’s defense by claiming that because Israeli citizens of Arab-Palestinian descent have access to the same formal rights as their Jewish counterparts, it therefore means Israel technically can’t be an Apartheid state. Whatever you call it, the Israeli government is carrying out gross human rights and international law violations in Occupied Palestine. It does so in ways that all at once resemble an Apartheid state, a settler-colonial one and just about any regime which systematically oppresses an ethnic group. What’s more, with them now unashamedly passing laws like the Nation State Law, which symbolically yet unequivocally declares that self-determination in Israel is unique to Jews, the Israeli government signals a slow march rightward obsessed with preserving the purity of a “Jewish Volk”—one that if followed through to its logical conclusion, will have unspeakable consequences for anyone outside of that identity. Truth be told, the persistence of the more than 50-year occupation demonstrates that as far as Israel is concerned, it’s sustainable. All that’s changed is its trajectory, one inevitably heading towards a single state albeit one extremely Jewish. So long as Israel remains a Zionist state, its relationship to the Palestinian people will necessarily be contemptuous. For this reason, the case for a single, constitutional and democratic state is a persuasive moral and ideological counterweight that begins by questioning the nation-state form of social organization, the soul of Israel’s project. The unavoidable question is whether or not it is practically feasible. The real question, is why those two issues should be taken up separately. South Africa can legitimize calls for the one-state solution by insisting that what made our struggle mostly successful, flawed as our society still is now, was by acknowledging the hopelessness of the situation and looking beyond the limitations of what was viewed possible. To be sure, South African moral leadership can only go so far, that’s undeniable. Although, despite the appearance of a pro-Israeli onslaught that dominates the height of media coverage, moods are shifting and conditions more amenable. New studies show that increasingly, ordinary Americans are open to a one-state solution of equal rights and citizenship. The One Democratic State Campaign initiated by mostly Palestinian and Israeli activists is reviving calls for a single state, and before its official launch in May, is gaining some traction (see here for its visionary proposal, and here for criticism of some of its aspects). Even in Israel, beneath the triumphant posture of Netanyahu’s Likud party, the sides aren’t so clearly marked. Writing for The Atlantic, Israeli author Micah Goodman remarks that most ordinary Israelis have “lost their sense of conviction” and that they are “confused.” The problem, as Goodman notes, is that the Israeli Right and Left are trading alternate but extreme visions of dystopia and chaos: for the the Right, it’s the catastrophe of withdrawal, for the Left, the catastrophe of remaining. For ordinary Israelis, this misleadership means being tied to a schizophrenic horseshoe of manufactured anxiety and fear. What accelerated change in Apartheid South Africa during the 1980s amidst a climate of mass unrest (as we are witnessing now in the Gaza Strip and West Bank) as well as increased state-securitization from then hardliner president P.W Botha (who bought weapons from Israel), was the re-articulation of a social order where any and all could imagine their place. The advent of the United Democratic Front in the 1980s, a multiracial coalition of trade unions, religious groups and students, massively revived the Freedom Charter’s vision of a united South Africa, one that the Apartheid government greatly feared. Behind the slogan “UDF Unites, Apartheid Divides” clarity dawned where confusion once fogged. This renewed internal struggle, revitalized the international struggle which eventually culminated in widespread boycotts, divestment and sanctions—in the view of many, this was the tipping point that toppled Apartheid. When Tony Judt correctly denounced Israel as an anachronism, he wrongly concluded that the one-state solution would come only at the behest of American leadership. Almost 16 years on, it is clear that this leadership won’t come from the US, no less when controlled by Trump (who is just more forthright about Washington’s standard pro-Israel position shared by mainstream Democrats and Republicans alike). Granted, US support is ultimately a necessary condition for an eventual solution, but South Africa can help generate sufficient conditions for a lasting one. From the Jordan river to the Mediterranean sea, Israel and Palestine belongs to all who live in it, Jew, Muslim or Christian, and no government can justly claim authority unless it is based on the will of people.